ANSWER Coalition leaders and organizers will make presentations and receive awards at the upcoming National Conference on Socialism in Los Angeles. The Nov. 13 and 14 event will feature two days of speakers, panels, organizing sessions, discussion and entertainment at the University of Southern California campus. Hosted by the Party for Socialism and Liberation, hundreds of workers, students, organizers, anti-war activists and progressive people will come together from across the United States. The Cuban Five (from left to right): Ramón Labañino, Fernando González, Rene González, Gerardo Hernández and Antonio Guerrero. The conference will begin at 9:30 am on both days. It is an all-weekend event. We encourage everyone to attend the entire conference. On Saturday night, Nov. 13, beginning at 6:30 pm, there will be a special International Solidarity and Awards Session, featuring speakers and statements from international groups and national liberation movements in the United States. 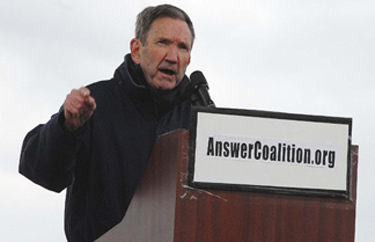 Former U.S. Attorney General Ramsey Clark is confirmed as a featured speaker. He will present the PSL’s first-ever “Fighters for Justice, Champions of Freedom” awards to some of the recipients, which include political prisoners, radical lawyers and longtime grassroots leaders. Click here to register for the conference in Los Angeles. Mumia Abu-Jamal: Revolutionary African American journalist unjustly imprisoned since 1981. His writings and commentaries resonate with working-class and poor people across the world. Leonard Peltier: Native American political prisoner and American Indian Movement leader unjustly incarcerated since 1976. The Cuban Five: Gerardo Hernández, Ramón Labañino, Rene González, Antonio Guerrero and Fernando González. The Five are Cuban nationals incarcerated for infiltrating right-wing terrorist organizations in Miami. Lynne Stewart: Radical lawyer serving an outrageous 10-year federal prison sentence. Stewart is guilty of nothing more than ardently advocating for the most oppressed and championing freedom and liberation. The Angola 3: Albert Woodfox, Herman Wallace and Robert King Wilkerson. Thrown into solitary confinement for decades, these heroic African American men were silenced for trying to expose segregation, corruption and abuse in the country's biggest prison. Woodfox and Wallace remain in solitary confinement. Wilkerson was released from prison in 2001. Muntadhar al-Zaidi: Iraqi journalist who threw his shoes at then-President George Bush in 2008. Al-Zaidi was imprisoned and tortured for his anti-imperialist actions. He continues to advocate for the Iraqi people and struggle against colonial occupation. There will also be a tribute to the late Lucius Walker, Executive Director of IFCO/Pastors for Peace. Mike Prysner: Iraq war veteran; Co-founder, March Forward! These are just a few of the speakers who will be present. Click here for a full conference schedule. We urge you register for the National Conference on Socialism today. Be there and bring your friends, family, co-workers, co-students and everyone you know. Click here to register for the conference.